You must select a type of steel, and you have the option to select all other attributes of the sword. If you leave any fields blank, we will use the most popular option, or the standard option. Pictures of each choice can be found below. Or you can write standard in the field and we will give you the most popular option for your samurai sword. The only factor that will change the price of your sword is the steel you select. 1050 steel is $399, T10 steel is $699, T10 Folded Steel is $1199, and tamahagane is $1899. All of the swords receive the same care, attention, and high quality components! Each sword is one of a kind, with so many possible variations, your sword will be custom made for you when you place your order. Because it is completely handmade, please allow 4-6 weeks for the sword to be forged and delivered to your doorstep like a normal order! We will send tracking, and sometimes deliveries are faster, just use this as a safe guideline! You can't rush perfection. Please rest assured these are of exceptional quality, and are quickly becoming our most high demand option. Once you design your sword, you can proudly look forward to this one of a kind piece that you will treasure for the rest of your life! Because each custom sword is handmade and one of a kind, there are no returns or exchanges on custom orders. All sales are final. 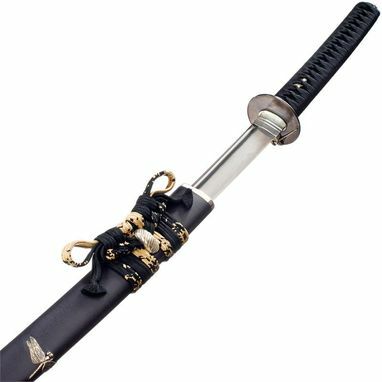 The quality is excellent, and we are confident you will fall in love with your custom katana! It is incredible to own a sword that nobody else on planet earth owns, made just for you. That is the true essence of the samurai.